^ Middleton, William Edgar Knowles. A history of the theories of rain and other forms of precipitation. Oldbourne. 1966. OCLC 12250134. ^ Pruppacher, Hans R.; Klett, James D. Microphysics of clouds and precipitation 2nd. Springer. 1997. ISBN 0-7923-4211-9. ^ Pouncy, Frances J. A history of cloud codes and symbols. Weather. February 2003, 58 (2): 69–80. Bibcode:2003Wthr...58...69P. doi:10.1256/wea.219.02. ^ Blanchard, Duncan C. From Raindrops to Volcanoes: Adventures with Sea Surface Meteorology. Courier Dover. 2004. ISBN 0-486-43487-7. ^ Harvey Wichman. Why do clouds always appear to form in distinct clumps? Why isn't there a uniform fog of condensation, especially on windy days when one would expect mixing?. Scientific American (Scientific American). 1997-08-04 [2017-08-23]. ^ Nave, R. Adiabatic Process. gsu.edu. 2013 [2017-08-23]. ^ Bad Clouds. www.ems.psu.edu. [2017-08-23]. ^ Horstmeyer, Steve. Cloud Drops, Rain Drops. 2008 [2017-08-23]. ^ 9.0 9.1 9.2 Elementary Meteorology Online. Humidity, Saturation, and Stability. vsc.edu. 2013 [2017-08-23]. （原始内容存档于2014-05-02）. 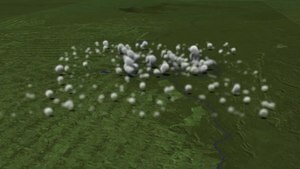 ^ Elementary Meteorology Online. Lifting Along Frontal Boundaries. vsc.edu. 2013 [2017-08-23]. ^ Mackerel sky. Weather Online. [2017-08-23]. ^ Lee M. Grenci; Jon M. Nese. A World of Weather: Fundamentals of Meteorology: A Text / Laboratory Manual 3. Kendall/Hunt Publishing Company. 2001: 207–212. ISBN 978-0-7872-7716-1. OCLC 51160155. ^ Freud, E.; Rosenfeld, D. Linear relation between convective cloud drop number concentration and depth for rain initiation. Journal of Geophysical Research. 2012, 117. Bibcode:2012JGRD..117.2207F. doi:10.1029/2011JD016457. ^ Largest Hailstone in U.S. History Found. 2003. ^ Pidwirny, M. (2006). 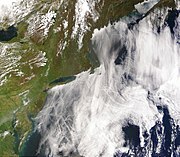 "Cloud Formation Processes" 互联网档案馆的存檔，存档日期2008-12-20., chapter 8 in Fundamentals of Physical Geography, 2nd ed. ^ Fovell, Robert. Approaches to saturation (PDF). University of California in Los Angeles. 2004 [2017-08-27]. （原始内容 (PDF)存档于2009-02-25）. ^ Pearce, Robert Penrose. Meteorology at the Millennium. Academic Press. 2002: 66. ISBN 978-0-12-548035-2. ^ National Weather Service Office, Spokane, Washington. Virga and Dry Thunderstorms. National Oceanic and Atmospheric Administration. 2009 [2017-08-27]. ^ Reiley, H. Edward; Shry, Carroll L. Introductory horticulture. Cengage Learning. 2002: 40. ISBN 978-0-7668-1567-4. ^ JetStream. Air Masses. National Weather Service. 2008 [2017-08-23]. （原始内容存档于2008-12-24）. ^ Rogers, R.R. ; Yau, M.K. A Short Course in Cloud Physics. International Series in Natural Philosophy 113 3rd. Elsevier Science. 1989. ISBN 0750632151. ^ KOROLEV, Alexei V.; MAZIN, Ilia P. Supersaturation of water vapor in clouds. Journal of the atmospheric sciences, 2003, 60.24: 2957-2974. ^ Lu C., Y. Liu, and S. Niu, 2013: A method for distinguishing and linking turbulent entrainment mixing and collision-coalescence in stratocumulus clouds 互联网档案馆的存檔，存档日期2014-03-08.. Chin. Sci. Bull., 58, 545-551. ^ Sirvatka, P. Cloud Physics: The Bergeron Process. College of DuPage Weather Lab. 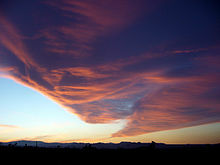 ^ Sirvatka, P. Cloud Physics: Types of Clouds. College of DuPage Weather Lab. ^ E.C. Barrett; C.K. Grant. The identification of cloud types in LANDSAT MSS images. NASA. 1976 [2017-09-03]. ^ 31.0 31.1 31.2 World Meteorological Organization (编). Definitions, International Cloud Atlas. 2017 [2017-09-03]. （原始内容存档于2017-03-27）. ^ Hsu, Jeremy. Strange clouds spotted at the edge of Earth's atmosphere. USAtoday. 2008-09-03. ^ 33.0 33.1 33.2 33.3 Stubenrauch, C. J.; Rossow, W. B.; Kinne, S.; Ackerman, S.; Cesana, G.; Chepfer, H; Di Girolamo, L.; Getzewich, B.; Guignard, A.; Heidinger, A.; Maddux, B. C.; Menzel, W.P; Minnis, P.; Pearl, C.; Platnick, S.; Poulsen, C.; Reidi, J.; Sun-Mack, S; Walther, A.; Winker, D.; Zeng, S.; Zhao, G. Assessment of global cloud datasets from satellites: Project and Database initiated by GEWEX Radiation Panel (pdf). Bulletin of the American Meteorological Society. 2013, 94: 1031–1049. doi:10.1175/BAMS-D-12-00117.1. ^ American Heritage Science Dictionary. cohesion science definition. 2010 [2017-09-03]. （原始内容存档于2013-03-29）. ^ cohesion – Princeton Wordnet dictionary. wordfind.com. [2017-09-03]. ^ The Westminster review. attraction cohesive cloud droplets. Baldwin, Cradock, and Joy. 1841. ^ UCAR Center for Science Education (编). The Troposphere – overview. 2011 [2017-09-09]. ^ How Much Does a Cloud Weigh?. 2013-04-04 [2017-09-03] （英语）.